Colombia has not had the same success as their South American compatriots , Argentina and Brazil. But what cannot be denied, is the countries fanatical love for the game. When great players come along to wear the shirt of the Selección de fútbol de Colombia, they are nationally respected as athletes. If they give their all for their country;, they are worshiped as gods. Here we list (in our opinion), the top ten greatest Colombian Soccer player of all time. Agree or disagree? Let us know in the comments section below. A big powerful striker named El Tren (the train). Adolfo Valencia was a physical phenom terrorising defences across seven football leagues. He played one season in Germany for Bayern Munich, finishing as the club’s joint top scorer and winning the Bundesliga. Adolfo Valencia also played for Atletico Madrid, Reggiana, PAOK, Independiente Santa Fe, América de Cali, Independiente Medellín, NY/NJ MetroStars, Zhejiang Lucheng F.C. and Unión Atlético Maracaibo. His inability to settle at a single club may have hampered his career. But he still makes it into our list at number ten. Valencia played 37 games for Colombia, scoring 14 goals. He added the fifth goal in the 0-5 drubbing of Argentina in the famous USA’94 qualifier in Buenos Aires. Willington Ortiz has legendary status among Colombian domestic football aficionados. Many Colombians believe he was the most skillful player Colombia has ever produced. Willington spent his entire career in Colombia, winning five Colombian league titles with Millonarios and América de Cali. A skillful midfielder with incredible ball control, pace, vision, and positioning, he scored 184 goals in 583 during the 1970’s & 80’s. Willington made 49 international appearances, scoring 12 goals. The team played in four Copa Americas, reaching the final in 1975 tournament, before losing a close 1-0 game to Peru. The eccentric goalkeeper was a pioneer of the El Loco keeper style from which he took his nickname. The kamikaze sweeper-keeper style became popular in 1980’s & 90’s South America, put the wind-up soccer purists. But for sure it was a sight to behold. His most famous moment with the ball bizarrely came during dead play, when he notoriously ‘scorpion kicked’ the ball against England at Wembley. As a goalscoring-goalkeeper he was prolific, scoring 41 goals in 380 appearances at club level, and 3 goals in 68 for Colombia. Scoring mostly from penalties and direct free kicks. The sweeper keeper style saw him take far greater risks than his contemporaries. It backfired horribly in the 1990 world cup when he lost the ball near the half way line, to concede a goal that saw Colombia knocked out against Cameroon. El Loco’s relationship with Pablo Escobar in his home town of Medellin at a time of serious social problems in the area, saw him mixed up in a kidnapping plot. El Loco was jailed in 1994 for his participation in the caper, and missed the world cup as a result. He played the majority of his career in Colombia, and a few other Latin American clubs. With only one season in Spain with Real Valladolid. A keeper with true legendary status. A solid defensive midfield anchor man. Reliable and hard as nails. He never turned his back on a 50/50 challenge, often going in hard. He never gave up, and fought until the end. With the ball at his feet, his distribution was dynamic and always dependable. His style allowed the flair players in the team to go about their business without worry. Álvarez won the Colombian championship with National Athletic (1991) and America de Cali (1992). He also won the Copa Libertadores (1989) and the Inter American Cup (1990) with National Athletic. With 101 appearances for Colombia and one goal, he was a long-standing national team fixture. He went on to manage the team in 2011, as well as managing various other Colombian domestic teams since retiring. In the 1990’s golden era of Colombian football, Freddy Rincón was a pivotal player as an attacking midfielder and forward. More dependable and consistent than some of his big names peers. Rincon played 84 times for Colombia, netting 17 times. He scored a legendary Colombian goal in the 1990 World cup, against the Iconic West German team starring Matthäus, Völler and Klinsman. Colombia needed at least a draw to qualify, and when the Germans went ahead in the 88th minute, Colombian hearts the world over sank. But in the dying seconds of injury time, Rincon on the end of an El Pibe through ball, nutmegged Bodo Illgner to put Colombia through to the last 16, and cementing his place in Colombian footballing folklore. He also played his part in the 0-5 win over Argentinian in the world cup qualifiers, bagging one goal. Rincón won the Colombian championship with America de Cali in 1990 and 1992. He also spent time in Brazil, winning the Brazilian Serie A and Camperoanto with both Palmeiras and Cornithians, and also the FIFA world Club Cup with the latter. Parma signed Rincón after his performance against Argentina to partner Asprilla, but the three non-EU player rule meant he was unable to register, and hence loaned for a season to Napoli. He then signed for Real Madrid for one season, before returning to South America. Rincón may not have been the greatest Colombian Soccer player ever, but he will never be forgotten that’s for sure. Super Mario’s 21-year career has seen him play at some of the biggest teams in Europe and South America. Paris Saint Germain, AC Milan, Nantes, Chievo, River Plate, San Lorenzo and Deportivo Cali. His club honours include the Colombian Primera A (Deportivo Cali 1998), the Argentine Primera Division (River Plate 1999 & 2000), The French Cup (PSG 2006), the French League Cup (PSG 2008), and Serie A (A.C Milan 2011). A stalwart defender who played his heart out wherever he played. That type of commitment made him a fan favourite at most of the clubs he played for, and although he rarely scored he managed a few memorable goals. Most notably, the winner for AC Milan in a 4-3 win against Lecce, after being 3-0 down at half time. Going on to win Serie A the same season. For Colombia Yepes was a solid and reliable fixture in central defence for 15 years (102 apps/2 goals). With Super Mario sat in front of goal the El Cafeteros were incredibly hard to break down. He was also in the squad that brought Colombia its first, and only Copa America in 2001. Tino Asprilla, was an enigma throughout much of his career, for supporters, opposition players, and team mates alike. His dribbling ability was unrivaled for its bizarre and unpredictable style. Mazy, jinking runs often saw him stumble his way through defenses with the ball almost glued to his foot. Incredible creativity with power and pace, was complimented with an ability to score highlight reel goals at critical moments. At club level he won the Colombian Primera A (Atletico Nacional 1991), the Copa Interamericana (Atletico Nacional 1990), the Coppa Italia (Parma 1999), the European Cup Winners’ Cup (Parma 1993), the European Super Cup (Parma 1993) and the UEFA Cup (Parma1995 & 1999). With the years at Parma being his most successful at club level. With Newcastle United in the English Premier League he gained cult status with the demanding Geordie fans. Despite being regularly kept out of the team by the deadly Alan Shearer and Les Ferdinand Partnership; Tino scored a hat trick against Barcelona in the Champions league to secure an historic 3-2 win. In the national team, he was instrumental in the 0-5 demolition of Argentina at their home ground. He scored two goals, assisted the fifth, and his long skillful run was ultimately responsible for Ricons goal. He was a clear man of the match in an epic team performance. Falcao, or el Tigre (the tiger) as he is known, is a complete out and out striker. Strong with both feet, and can score from anywhere. Incredible stamina, and decent pace, and comfortable with the ball at his feet or in the air, making him every managers dream striker. At club level he won the Argentine Primera Division (River Plate 2008), Portuguese Primera Liga (Porto 2011), UEFA Super Cup (Atletico Madrid 2012), Copa Del Rey (Atletico Madrid 2013), UEFA Europa League (Porto 2011 & Atletico Madrid 2012). Falcao currently holds the record for goals in a single Europa League campaign, of 17 goals in 14 matches for Atletico, and helped them to beat local rivals Real Madrid for the first time in 14 years. In Portugal and Spain he amassed a run of 93 goals in 119 games. Before requesting an ill-judged move away from on-the-rise Atletico Madrid to under-performing Monaco. As captain and talisman for the national team he carried the team on many occasions. Falcao was the player all hopes rested on, and it was a huge blow when a cruciate ligament injury saw him ruled out of the 2014 world cup. Two poorly timed big loan moves to Manchester united and Chelsea didn’t work out, and Falcao is now back at Monaco. Many believe he would be at the top of this list today if the injury had not disrupted his career. We hope he can regain that deadly form again soon. If we were to base this top ten list of Colombian Soccer greats on perceived ability alone, El Pibe (the kid) would be #1 by far. In Colombia, he will always be the greatest ever for those of a certain generation. Although he didn’t have a very successful club career, he attained hero status in the Colombian national shirt. At club level he won the French Cup (Marseille 1990), and the Colombian Primera A (Atletico Junior 1993 & 1995). Valderrama appeared in 619 professional appearances, for 11 different teams. He scored 54 goals in that time, but this number does him a great disservice. As a deep lying playmaker his priority was orchestrating the team, and creating chances for others. His assist records were phenomenal, and his 26 assists in an MLS season (Tampa Bay Mutiny 2000) has looked unbeatable ever since. For the Los Cafeteros he made 111 international appearances, scoring 11 times. 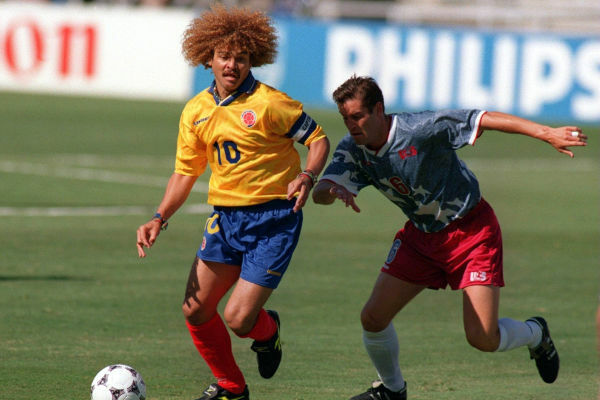 Valderrama represented Colombia at three world cups (1990,1994 & 1998). He will always be remembered for setting up Freddy Ricon for the equaliser against the great West German team and eventual winners of Italty’90, and was a part of the great 0-5 thrashing of Argentina. A versatile left-footed midfield maestro, who can play anywhere across the centre of the park. James has the ability to control games, and is a goal threat from anywhere on the pitch. At club Level he has won the Argentina Primera Liga (Banfield 2009), The Portuguese Primeira Liga (Porto 2011, 2012 & 2013), The UEFA Europa League (Porto 2011), The UEFA Champions League (Real Madrid 2016), the UEFA Super Cup (Real Madrid 2014 & 2016) and the FIFA Club World Cup (Real Madrid 2014 & 2016). For the Colombian national selection, he has proven himself one of the greatest Colombian Soccer players of all time, with excellent performances. Becoming the team captain at the age of just 23 years old. At the time of writing he has 52 caps and 17 goals, with plenty more to come we are sure. During the 2014 World Cup he became the first Colombian to win the Golden Boot scoring six goals in the tournament. James was denied the Golden Ball, some say for political and commercial reasons, after it was awarded to Lionel Messi. With even the Argentine legend, Diego Maradona, saying James deserved the award. The tournament paved the way for an 80 million Euro move from Monaco to Real Madrid, making him the most expensive Colombian soccer player in history. In our opinion, the greatest player to play for Colombia, and his career is still not over. Let us know what you think, in the comment section below. Previous Post: Generosity of the Colombian People? Next Post: UK IMMIGRATION POLICY; AN OPEN & SHUT CASE!